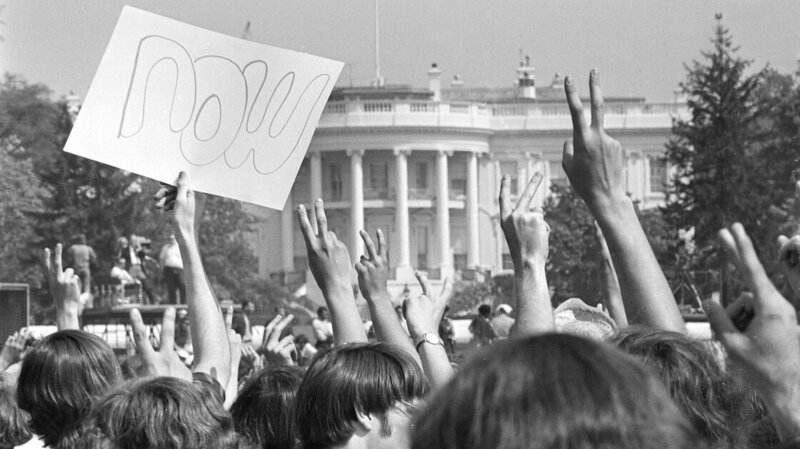 Anti-Vietnam War demonstrators hold up signs and raise their hands toward the White House in a protest. The term "baby boomers" stuck for this generation because of their tumultuous youth. Nobody likes to be labeled. We especially hated labels back in high school, when we were forced into one of several groups: jocks, nerds, theater kids, freaks and so on. Now imagine categorizing people based on the years they were born: the GI generation, Generation X, baby boomers, millennials. When we label generations, that's exactly what we do, except the groups are much larger than one high school's cliques. Who names generations, what do these names mean, and how do we avoid stereotyping a group of people that can span decades? 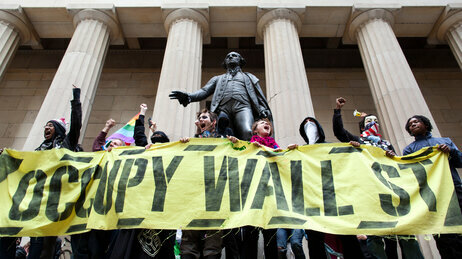 Occupy Wall Street demonstrators stand and cheer in front of the George Washington statue on Wall Street. Millennials were heavily involved in this movement. "On the one hand I would say that obviously what a generation is does not necessarily have anything to do with its name," says Neil Howe, a historian who coined the term "millennial generation" in the 1991 book Generations, which he co-authored with the late William Strauss. "Sometimes these names are very random and contingent on the year." Which is how Howe and Strauss invented the name millennials: "We thought that an upbeat name would be good because of the changing way they were being raised. They would be the first to graduate high school in the year 2000, so the name millennial instantly came to mind," Howe says. The naming of generations was not always so obvious. In fact, Generation X, the name for those born between 1965 and 1980, did not exist while Howe and Strauss were writingGenerations. They were originally called the baby busters because birth rates decreased after the previous generation, the baby boomers. "Labels that derive from the previous generation don't tend to stick," says Jean Twenge, a psychology professor at San Diego State University and author of Generation Me: Why Today's Young Americans Are More Confident, Assertive, Entitled — and More Miserable Than Ever Before. Though there is a consensus on the general time period for generations, there is not an agreement on the exact year that each generation begins and ends. They were teenagers during the Great Depression and fought in World War II. Sometimes called the greatest generation (following a book by journalist Tom Brokaw) or the swing generation because of their jazz music. They were too young to see action in World War II and too old to participate in the fun of the Summer of Love. This label describes their conformist tendencies and belief that following the rules was a sure ticket to success. The boomers were born during an economic and baby boom following World War II. These hippie kids protested against the Vietnam War and participated in the civil rights movement, all with rock 'n' roll music blaring in the background. They were originally called the baby busters because fertility rates fell after the boomers. As teenagers, they experienced the AIDs epidemic and the fall of the Berlin Wall. Sometimes called the MTV Generation, the "X" in their name refers to this generation's desire not to be defined. They experienced the rise of the Internet, Sept. 11 and the wars that followed. Sometimes called Generation Y. Because of their dependence on technology, they are said to be entitled and narcissistic. These kids were the first born with the Internet and are suspected to be the most individualistic and technology-dependent generation. Sometimes referred to as the iGeneration. The Generation X label first appeared in a Robert Capa photo essay on young adults coming of age after World War II. The name resurfaced in 1964, when a London publication did a series on British youth culture, which eventually became a book called Generation X. And when a young Billy Idol was looking for a band name in the mid-1970s, he remembered the book from his childhood and claimed the title. Generation X wasn't the preferred label until Douglas Coupland's 1991 book, Generation X: Tales for an Accelerated Culture, explained that the letter "X" was meant to signify his generation's desire not to be defined. "We were this unknown, disaffected generation," says Matt Carmichael, journalist and author of Buyographics: How Demographic and Economic Changes Will Reinvent the Way Marketers Reach Consumers. Before Generation X, there were the baby boomers, named to describe the economic boom after World War II and, later, the rise in fertility rates. Even the U.S. Census Bureau uses the name, Howe says. "It may have stuck partially because their adolescence and young adulthood was tumultuous, so the idea of it being a boom had some resonance," Twenge says. Other generations were named to describe individuals' collective attitudes and behaviors. The silent generation were too young to see action in World War II but were too old to take part in the Summer of Love. "Cautious and conformist, they act like middle-aged adults even though they're only 22," explains Howe, adding that this label first appeared in a November 1961 Time article. But this characterization of the silent generation wasn't realized until well after the fact, says Carmichael. "A good generational name will take that into account — that you can ascribe the meanings as you need them," he says. That was sort of how it worked with the GI generation, fighters in World War II, the group that came before the silents. Journalist Tom Brokaw wrote a book called The Greatest Generation about them. Howe says they are sometimes referred to as the swing generation because of their jazz music. Journalists and magazine editors aren't the only competitors in the generational naming race. Advertising executives label generations in order to, in theory, better reach these large groups of people. "In terms of market research, marketers and brands like being able to have labels to describe people," Carmichael says. "It helps to be able to communicate with them and to them." In a 1993 Advertising Age editorial, the term Generation Y was used to describe what is now known as the millennial generation. But by 2005, it became clear that Ad Age's analysis of Gen Y was completely misguided. "We were both kind of talking about the same kids, but there was a different interpretation," Howe says. "Gen Y painted a portrait of this generation of kids that were extreme radicalized versions of Generation X, and we said no, they aren't like that at all. If you look at the data on this, they are completely the opposite with risk-taking." 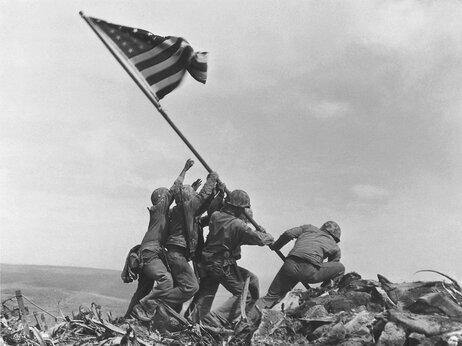 U.S. Marines raise the American flag atop Mount Suribachi, Iwo Jima, on Feb. 23, 1945. The generation who fought in World War II is often called the GI generation or the greatest generation. In 2012, the trade magazine accepted defeat. "Generation Y was a placeholder until we found out more about them," says Carmichael, who used to write for Ad Age. "In many ways it's not a better name, but I think that millennial at least gives you the sense that it's a turning point — that there is something different going on within this generation and that they are living in times that are kind of a turning point as well." The problem marketers often tackle is that not everyone identifies with the label chosen for their generation. "The labels help companies and the labels help media," says Erica Williams Simon, a social impact and communications strategist. "The labels help people who are trying to reach young people, but they're completely irrelevant to young people. The labels do nothing to shape our identity. Labels are pretty much irrelevant because your life experience is what shapes and defines you." She adds that a downside to generational labels is that they can lead to stereotypes — cue all the research about millennials being technology-obsessed and self-involved. What Will The 'I' Stand For? Despite this, experts are still debating what to call the generation after the millennials. There are a few names floating around — Generation Z, plurals, Generation Wii — but iGeneration seems to be winning. Simon says choosing iGen will exclude a lot of people. "If we identify the next generation solely by technology we're forgetting about the low-income young people who don't have the access to technology that higher-income young people have," she says. "It's very hard to label something in a way that reflects everyone's experience." Carmichael still likes iGen because it leaves room for interpretation. "I also like the idea that the 'i' could be any number of things: It could be for interactive, it could be for international, it could be for something we haven't thought of yet, but in 10 years when we know this generation, we can say, 'Now the 'i' stands for this,' " he says. Samantha Raphelson is a digital news intern for NPR.org. You can reach out to her onTwitter, where she is often tweeting obsessively about the Foo Fighters and the Phillies.